Hi, I’m Gandie. My girlfriend and I are on an adventure around the world---we are traveling through the Middle East, then on to Turkey, down through Africa, and finally over to South America. We’ve been on the road for over 200 days, visited 13 countries, and made 7 To Go videos for the series. The To Go series is my first attempt at travel documentary filmmaking. I want to see the world and experience the similarities and differences in the cultures of every country. During our trip, we mainly used our camera for daily and detailed shots and our drone for aerial photography and selfies. 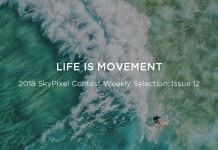 With this article, I would like to focus on my drone, the DJI Mavic Pro, and how it has become an indispensable part of our journey. 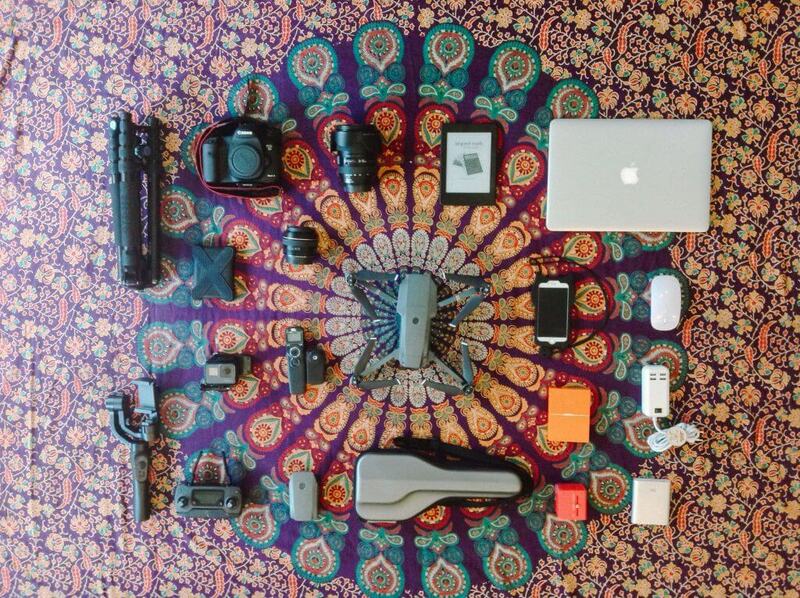 What equipment did we take? One of the most important things for long-term travel (two years in our case) is luggage. Apart from such daily necessities as clothes and personal hygiene products, we also packed a laptop and photography equipment. Between us, we have a 65L and 70L backpack, with all documentary equipment packed in a smaller bag. 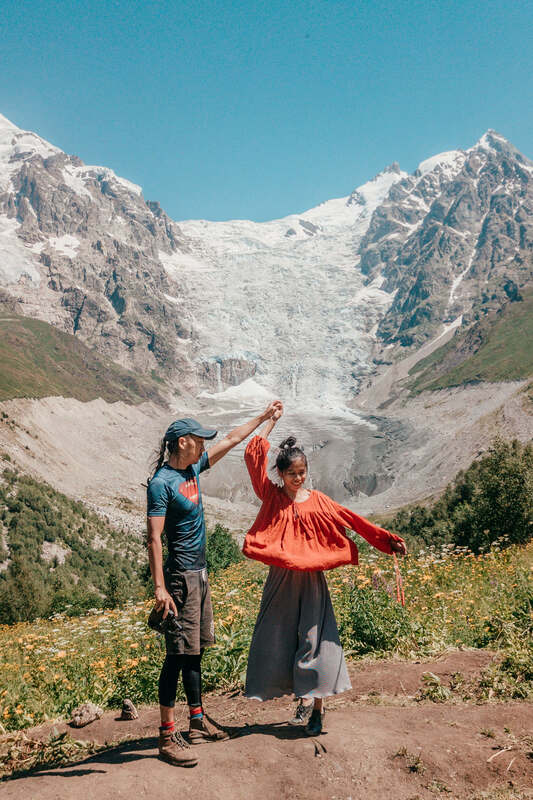 The equipment used in the To Go video series included a Canon 5D Mark III, 50 mm and 24-105 mm lenses, a GoPro HERO5, a DJI Mavic Pro, an iPhone 6S, iPhone 7, and a handheld stabilizer (which we lost in Armenia, unfortunately). 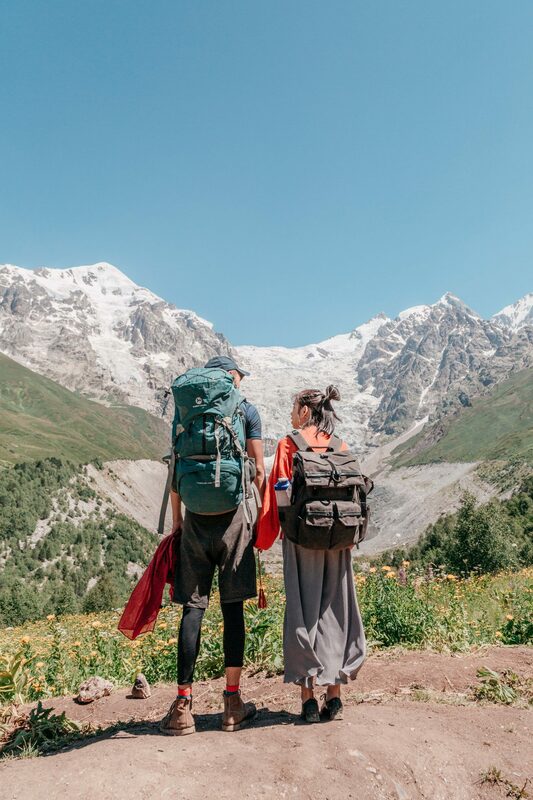 Throughout our travels, we usually have to walk at least 5 km carrying a 20 kg load, so the photography equipment that we carry has to be both practical and lightweight. 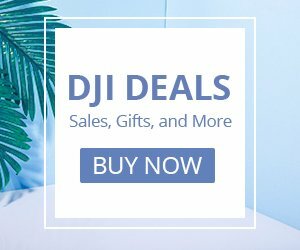 In this regard, the DJI Mavic Pro is definitely the right choice. 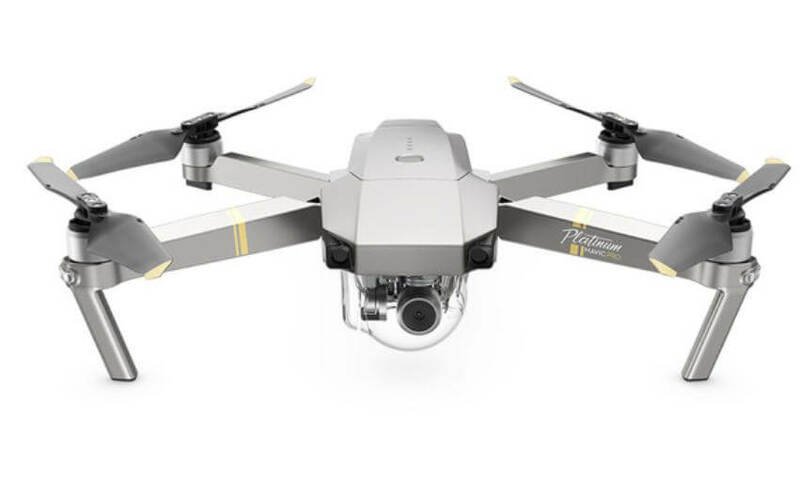 The folded Mavic Pro has the same footprint as the iPhone 7 Plus and weighs only 743 g, which is even lighter than the Canon 5D Mark III body. The convenience of the Mavic Pro is really quite impressive. This convenience was especially evident when we hiked along the Caucasus Mountains in Georgia for four days and three nights. 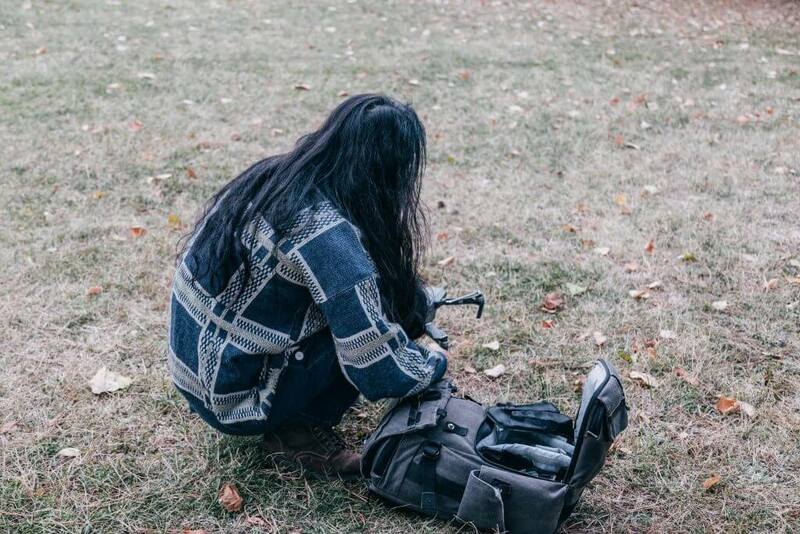 I carried all the clothes and food in my bag, while my girlfriend carried all the filmmaking equipment. 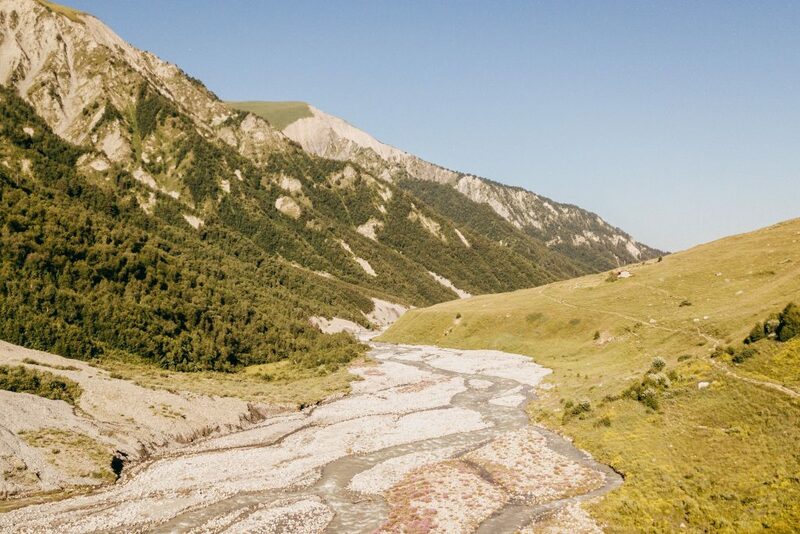 The lightweight packs enabled us to easily explore our surroundings and quickly capture the stunning Caucasus scenery with the Mavic Pro. 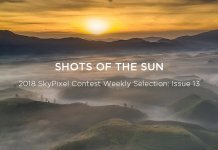 Having the Mavic Pro allowed us to capture the dramatic landscape from truly unique perspectives, bringing our videos and photos to life. To best record those special travel experiences, the most important thing is imaging quality. 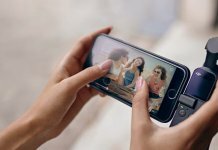 The Mavic Pro is small yet powerful, and its RAW video and photo capabilities supports the most flexible approach to post-processing to really make those captured memories pop. The following two photos are RAW files captured by the Canon 5D Mark III (on the left) and Mavic Pro (on the right) during the day. As can be seen, the Mavic Pro is capable of capturing very impressive details. We took pictures of places and each other everywhere we went, but for those extra special places, we just couldn’t resist getting selfies of the two of us together. 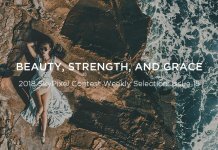 In these instances, our “cameraman” included new friends, complete strangers, our tripod, and of course our Mavic Pro, which turned out to be the best photographer out of all these. 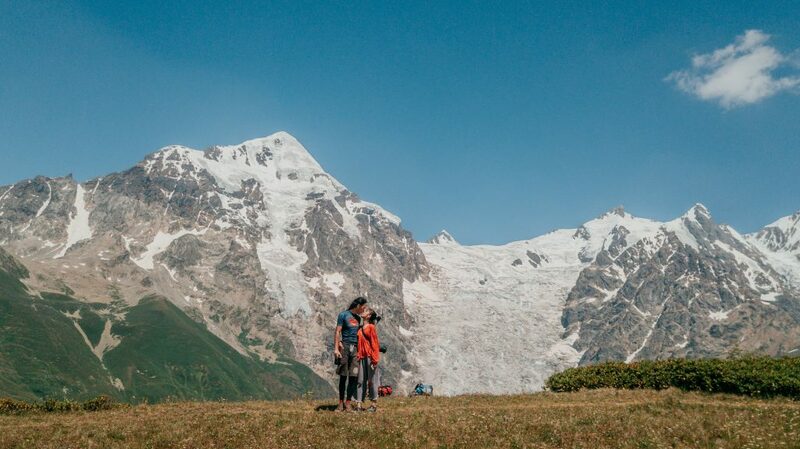 While hiking near Mestia, a charming village high up in the Caucasus Mountains, the climb and stunning views of the towering snow-covered peaks surrounded by a sea of flowers left us absolutely breathless. We absolutely had to shoot a video with the Mavic Pro there to record the magical vistas. 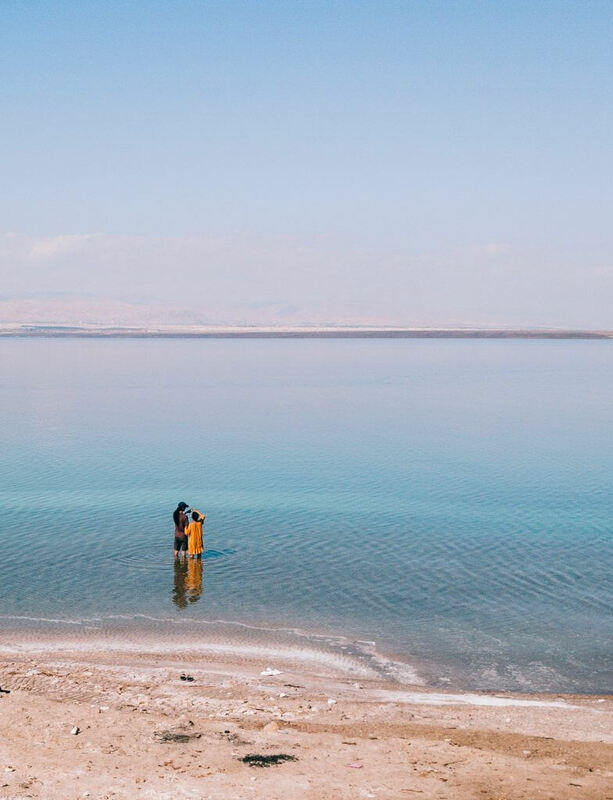 Later on the trip, in Jordan, we were lucky enough to seemingly have the Dead Sea to ourselves. We didn’t bring our tripod due to its weight, and yet again our Mavic Pro came to the rescue to take the amazing selfie below. 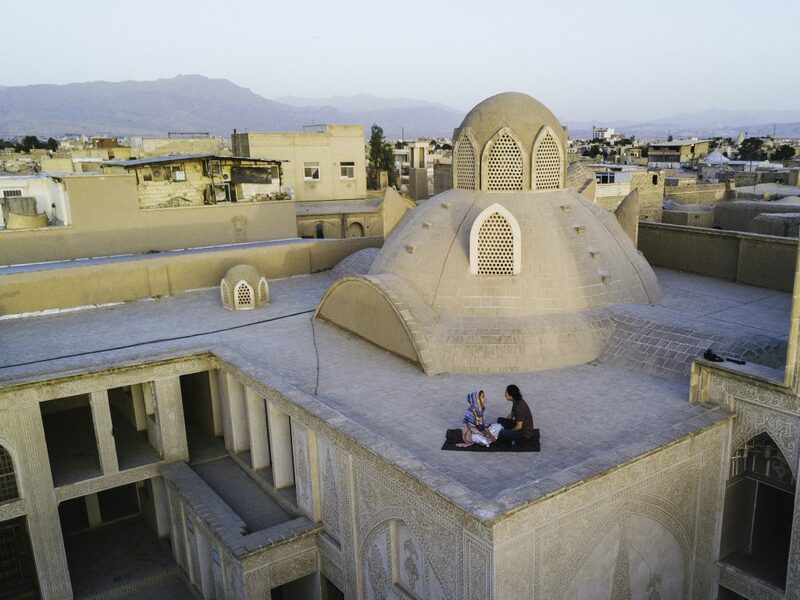 In the ancient city of Kashan in Iran, we got up very early to shoot the sunrise. With front lighting, we took yet another perfect photo with the Mavic Pro that really symbolizes the special time that we had there. 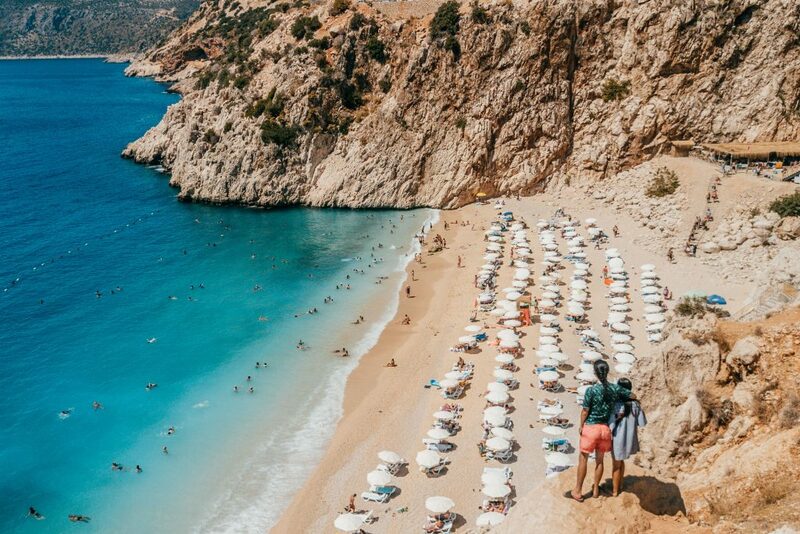 Driving down the D400 highway in Turkey, we passed a picturesque white beach with crystal-clear blue seawater. 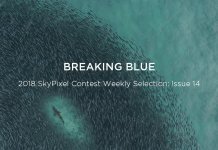 The sharp contrast between the clear ocean and the craggy coastline inspired us to capture the scene by flying the Mavic Pro 100 meters above the beach below. 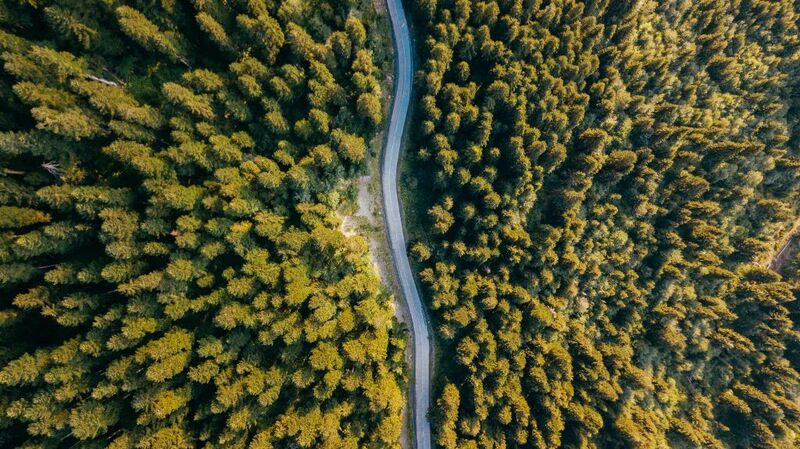 The Mavic Pro gave us truly unique perspectives that just wouldn’t be possible using our other cameras. 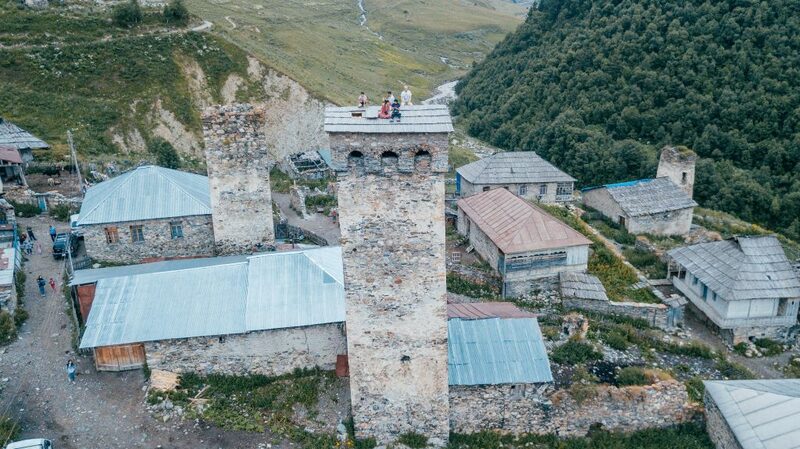 While hiking in Georgia, we climbed up a 30-meter high tower in a village in the heart of the Caucasus Mountains. 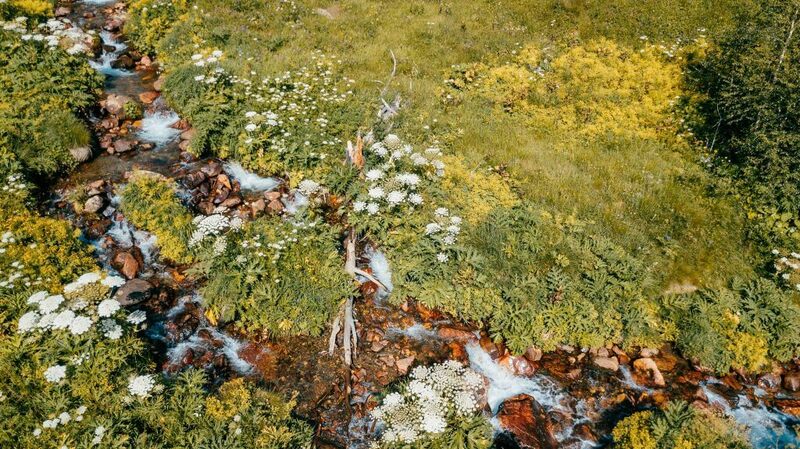 The Mavic Pro captured the breathtaking photos below. Drones are now playing a more and more important role in many different industries. I once watched a Korean movie called Tunnel in which the actor was stuck in a collapsed tunnel. As the search and rescue team arrived at the scene, the tunnel was still unstable and wasn’t safe enough for them to enter. They sent in drones to inspect the tunnel to assess if there was any further potential collapse. 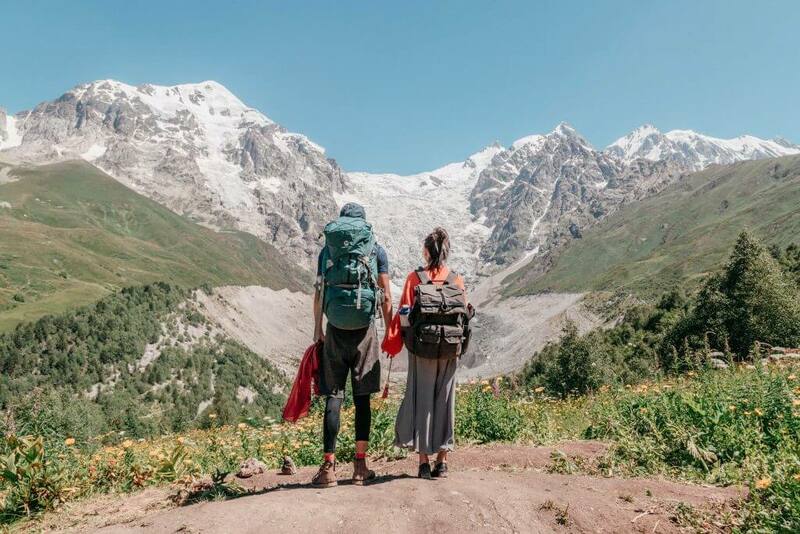 That point in the movie suddenly dawned on me while hiking in the Caucasus Mountains, where we got lost and there were no landmarks or Internet coverage to help point us in the right direction. As in the movie, I realized that we could use the Mavic Pro to quickly go where we could not and give us the perspective we needed to head in the right direction. We finally got back on track and realized that the Mavic Pro can be used for so much more than just taking videos and photos. Due to our fast-paced travel itinerary, we were only spending two or three days at most in each place. This meant that we couldn’t take videos or photos as we would back home, and we really had to push ourselves to make the most of our limited time in these special places that we’d probably never visit again. Because of this, we had to make sure that battery life would be enough to last until our next chance to charge them. We carried two Mavic Pro batteries everywhere we went. 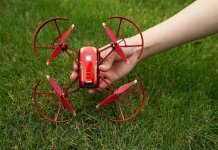 One battery usually lasts for about 27 minutes, so we had a total flight time of around 50 minutes with two batteries. At the beginning of the trip, I just casually flew around, partly for fun, partly for taking videos and photos. This obviously was not the most efficient use of limited battery life. With more practice, I changed my flying habits to save more time and battery life. Now I usually pore over a 3D view of the surroundings using Google Maps to consider what the best angles and perspectives may be. With practice, this approach has become a much more efficient use of the Mavic Pro’s batteries where occasionally I was able to capture a day’s footage using only one battery. 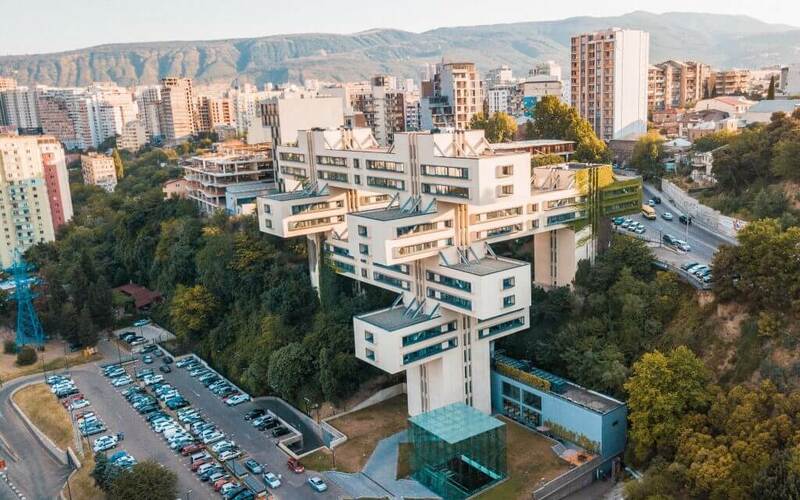 While in Tbilisi, the capital of Georgia, we found this bizarre building that, from Google Maps, resembled the petals of a flower. We captured it with our drone, which only took ten minutes. Later we realized that it was the Tibilisi Public Service Hall building. The Bank of Georgia in Tbilisi is also uniquely constructed, and so we set off early in the morning to capture it in the golden light of dawn. 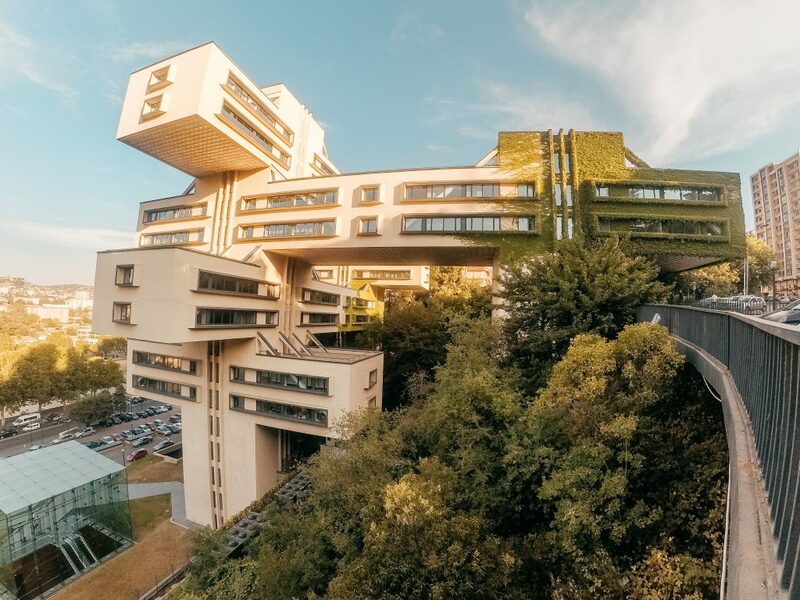 The building is magnificent in a quirky way, with plants climbing up the walls and the entire architecture is like something from a different dimension. Below is a comparison of how different the building looks through the Canon 5D Mark III, GoPro HERO5, and the Mavic Pro respectively. During our trip, I could usually charge the batteries every day, but there were exceptions. When we were traveling through the Vadi Ram Desert in Jordan, the only source of electricity was the electric generator in the hotel, which was only on for five hours a day. I carefully calculated when I would need aerial footage and figured out an effective charging schedule to fully charge the two batteries. The inevitable wear and tear of adventure was ever-present through our travels and really pushed both us and our equipment to the limits. While we were hiking in Georgia, I attempted to cross a river to shoot aerial photos. However, the rocks were so slippery that I fell in after stepping onto the first one and the remote controller (RC) in my hand got fully submerged, with the Mavic Pro still hovering at 15 m high over my head. I quickly clambered to the bank and checked them. The screen was flashing and fearing that the drone would lose control, as well as risk battery damage, I immediately landed the aircraft and turned off the RC. As soon as we got back to the hotel, I tried to turn it on only to find that it wasn’t responding. The day after, just when I was preparing to use just my cellphone as a standalone control for the rest of the trip, I found that the RC screen had come back to life! Although it did not fully recover, I kept on drying it and on the third day, I heard the familiar beep when turning on the RC—I knew my beloved Mavic Pro RC would not let me down! When I got my hands on the Mavic Pro for the first time, I couldn’t wait to take it for a spin. Since it was my first flight, I kept telling myself to be careful. But after settling into it, I had become too dependent on the vital obstacle avoidance. Once I set the Mavic Pro to Return to Home (RTH), by pushing the control stick fully to the left, it collided with branches on its way back and fell to the ground. It was not until then that I realized that only the front obstacle avoidance was available during RTH. Fortunately, the Mavic Pro was unscathed by the collision, so I was able to continue documenting the journey with aerial photography. During a hike in Cappadocia, Turkey, the burning midday sun forced us to take shelter in a cave. As it was perfect for aerial photography, I took out the Mavic Pro and directly launched it inside the cave. Much to the annoyance of my companions, dirt and sand were blown up as soon as the propellers started rotated. I immediately landed the drone and switched the motors off. But when I was folding up the propellers, I found there was something inside the motor causing them to not rotate as smoothly as before. Luckily, after detaching the propellers and blowing the sand grains out, they worked as perfectly as before. No-fly zones (NFZ) cause a headache for all travelers that carry a drone. Since the regulations for drones vary from country to country, a major difficulty was understanding the different policies before we started the journey. For us, we set off from Guangzhou, China, 251 days ago and have passed through Malaysia—Iran—Armenia—Karabakh—Georgia—Turkey—Serbia—Republic of Montenegro—Albania—Macedonia—Lebanon—Jordan— and are currently in Egypt. When setting off from Guangzhou to our first destination—Kuala Lumpur— I directly put my drone in my backpack and passed through airport security without issue, which has been our experience at every other check so far. 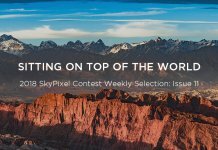 When searching for information on local drone policies, first I visit the official DJI website to check NFZs of the destination country and travel tips. Additionally, I also checked social media sites like Facebook and Instagram for the latest aerial photos of a destination, to see whether drones are actually allowed to fly in that area. So far, it has become apparent that drones are banned in many places, including Istanbul in Turkey, Beirut in Lebanon, downtown Yerevan in Armenia, most cities in Iran, Petra in Jordan, and now for seemingly the whole of Egypt. When you are not sure about whether drones are allowed in a place and you really want to give a try, I’d suggest going somewhere quiet with few people and do a quick test flight. Remember, safety always comes first. In spite of this careful approach, I still got stopped by the police when flying above the Cascade Square in Yerevan, the capital of Armenia, intending to capture the magical sunset. As I was landing the drone, the policemen noticed the noise of the drone and warned me that drones are banned in that area. In other destinations, drone restrictions are more clearly enforced. In Petra, Jordan, for example, notices of drone restrictions are displayed on the ticket barriers. Noise is another problem when traveling with drones. 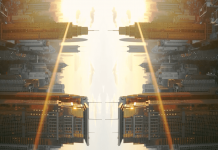 Some tourist attractions are overcrowded, leaving limited space suitable for drone flight. But even when there aren’t many people around, the noise of a drone can still attract unwanted attention, or even raise safety concerns if there is limited clearance. While we were taking a drone selfie in Armenia, another traveler came over and asked me to land the drone because it was too noisy. 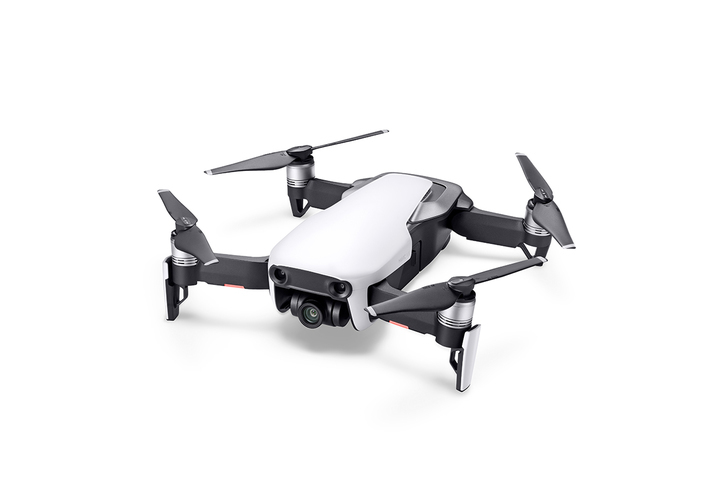 During my trip, I paid close attention to DJI’s announcements of new products, including the highly anticipated Mavic Air that has recently been released. 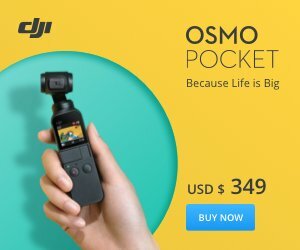 It costs less than Mavic Pro and weights much less. As a keen traveler and filmmaker, I am used to carrying at least 10 kg of equipment and know firsthand the importance of every single gram of that equipment. 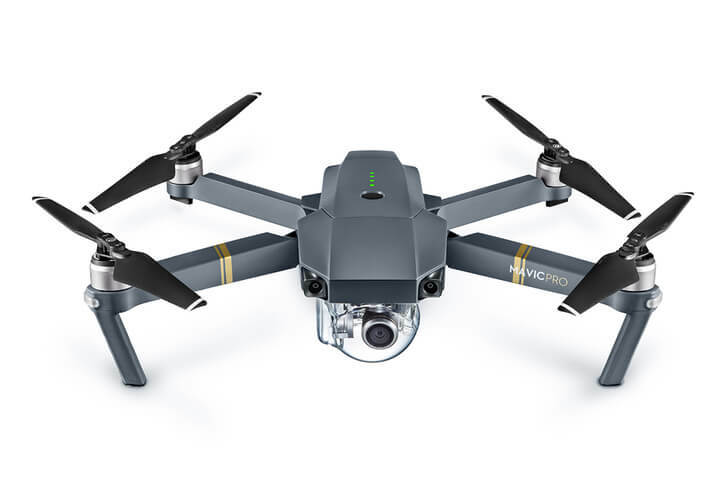 I really can’t wait to get my hands on the Mavic Pro’s lighter brother and see how it compares!